So here we are, only a few updates left before 1.0 and I wanted to give you a run down on what to expect. Let’s start by talking about what’s coming up in the next patch, which isn’t far away now. We’ve been calling the next patch the combat update, and with good reason. The goal of this patch is to entirely revamp the combat and the moment to moment gameplay in Starbound by revamping weapons, monsters, quests, rewards, vehicles and more. Until now, weapons in Starbound were a combination of hard coded engine features and the configuration files that controlled them. This has changed drastically in the combat update with the engine now allowing for scripted weapons. 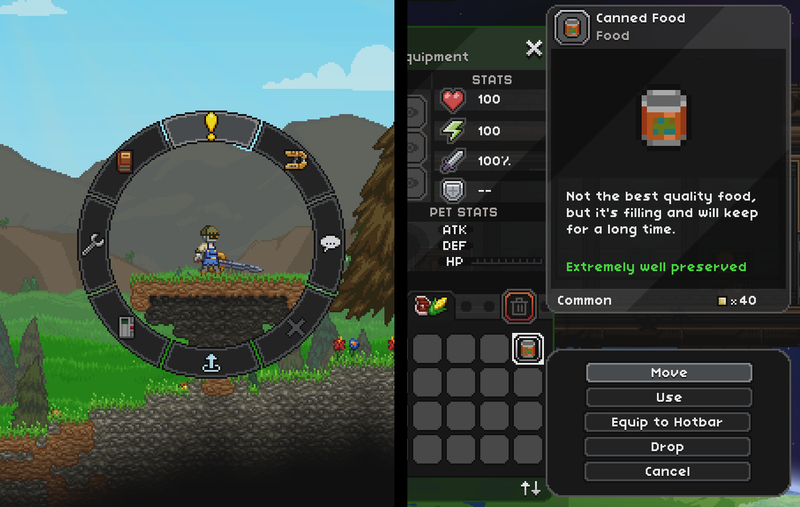 Creating entirely unique weapons has become massively easier and as a result from this point forwards Starbound patches will include wonderful new items far outside the scope of the previous item engine. Modders will also be able to take advantage of this system to create incredible new things. The sky’s the limit on this one. Weapons in vanilla Starbound now fall into two categories, generated and unique. Generated weapons have been converted to the new scripted weapons system and we’ve given them awesome special moves as a result. The general weapon classes have also been revamped in their primary fires. Hammers require a charge up, spears can be held out defensively and so on. We’ve worked hard to give each type of weapon it’s own identity and have built the special attacks around this identity. Weapons also have elemental types and in future patches we’ll be using those to give damage bonuses and reductions on certain enemies. We’ve worked really hard on ensuring all of the feedback and damage responses from these weapons is satisfying and spot on. Knockback has been massively tweaked, hitboxes, hit sparks, sounds, you name it. Combat ‘feels’ so much better. Monsters in Starbound have been a mixed bag. We’ve worked hard on the procedural monster generation system and whilst it achieves a lot of things, we felt that the game was missing recognisable monsters with truly unique hand crafted behaviour. That’s where these hand crafted monsters come in. In a similar manner to the weapons (though not quite to the same extent) we’ve built a system to allow us to add unique monsters efficiently and easily. This also extends to modders. The addition of these monsters will allow us to use them in quests, provides hand crafted challenges for missions and gives us a good way have monster drops make sense. There are unique monsters for each sub biome and a large pool of general unique monsters that will pop up from time to time. We’re making sure there’s incentive to catch every unique monster and put together a complete menagerie. All of the current Starbound quests are going to be replaced by 1.0. We’ve been building out the quest system and we’re finally at a point where we can replace some of the placeholder quests. Many of the new quests will appear in the story update but the combat update will contain procedurally generated colony quests. From time to time your colonists will have errands they’d like you to run. These quests form a quest line with an overall goal that may have a small, permanent effect on your colony as well as your colonists relationships. 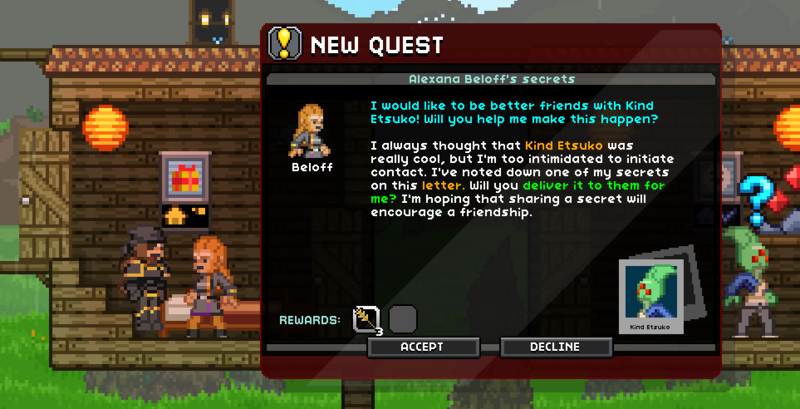 Quests are varied, you might be delivering secret notes between colonists or protecting your colony from bandit attacks. The generated quest system is something with the potential to expand into something huge in the future. Up until this point vehicles in Starbound have been using the tech system. That means vehicles were merely extensions of the player, with their movement entirely being controlled client side. This system had a great number of limitations. With the combat update we’re introducing true vehicles into Starbound. Much like the weapon system, vehicles are scriptable, they also exist server side as an entity separate to, but controlled by players. This means multiple players can enter the same vehicle, players can leave their vehicles to sit in a garage persistently and vehicles can have their own health, collisions and so on. To start with we’ll be adding a handful of finely tweaked vehicles. But again we haven’t just built some vehicles, we’ve built an entire system so both the developers and modders can add new, completely unique vehicles quickly and easily. Besides these features, the combat update contains a great deal of miscellaneous additions and fixes. More than I can list here. So what about after the combat update? We’re planning to put out 2 more patches before 1.0 (and many afterwards). We’re also planning to revamp how mods are applied and managed, add steam workshop support and simplify multiplayer, with the ability to join games via the steam friends list. There’s a great deal more to these two patches, including massive performance optimisations, multiplayer improvements and controller support but we’ll be talking more about those closer to their release. 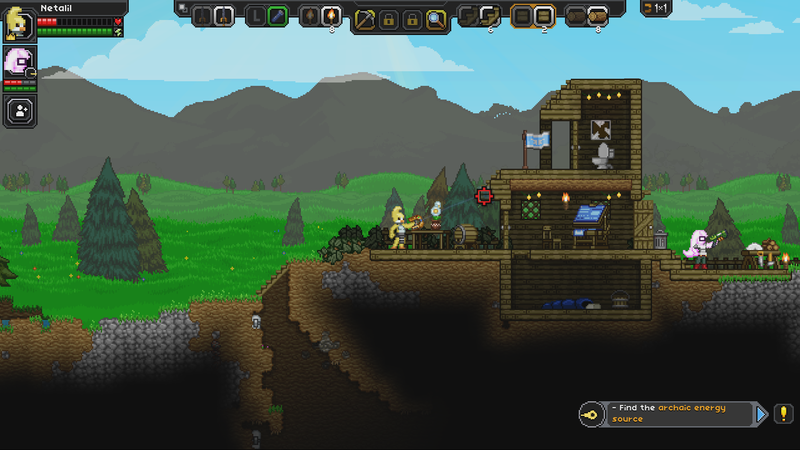 We plan to support Starbound far beyond the 1.0 release. We’re building a universe that’s capable of being taken in a great number of different directions and we’d like to start polling the community to find out where you’d like it to go next. In the mean time, follow us on twitter, check out our daily blog updates and we’ll keep you informed. Thank you for supporting Starbound guys, we’re almost there!